Cooking and baking were skills that were taught to me when I was a child. My mom was (and still is) an amazing cook and made sure that all of her girls knew how to cook. I was homeschooled and cooking was a part of my education. Mom called it home economics and each day, my siblings and I would take turns preparing lunch for the family. We would have to pick a recipe, assemble the ingredients and make the meal. Mom would help if we needed it but for the most part, we would work by ourselves. Learning how to read a recipe was so important and now that I have a family of my own, preparing home cooked meals is a part of life. I love trying new recipes and sharing them with my family. 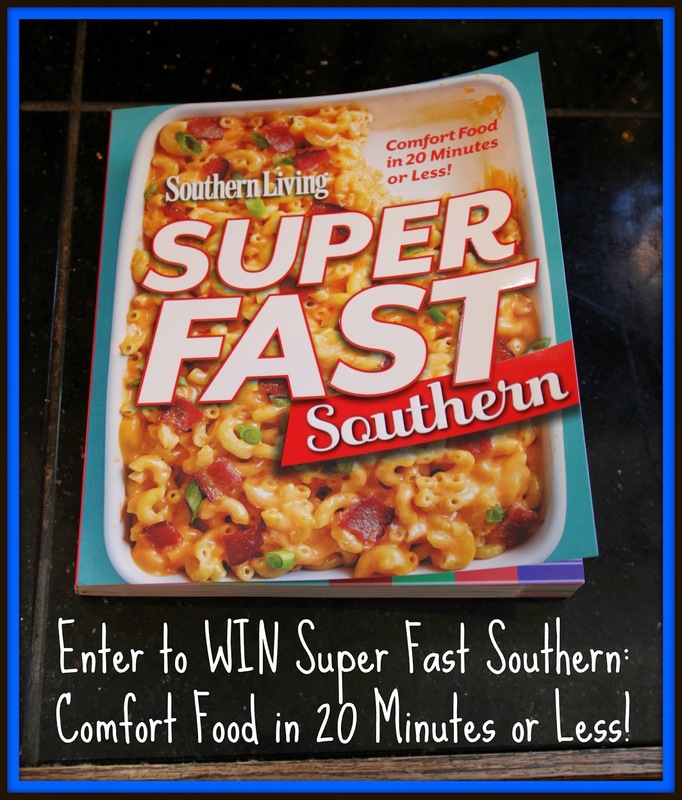 Southern Living has recently released their newest cookbook called Superfast Southern: Comfort Food in 20 Minutes or Less and my oh my...comfort food is my FAVORITE to cook! When I hear the term comfort food, I think about foods that are hot, creamy, filling and easy to prepare. This cookbook features over 120 recipes that can be prepared in 20 minutes or less. What busy mom wouldn't appreciate that?!? Top 10 Superfast Secrets – simple rules for quick cooking. Instant Adds and Easy Sides -- clever store-bought toppings and simple sides that pump up the flavor in a snap. Ready-in-30 and 15-Minute-Prep tabs mark the time for each recipe, so you’ll know at-a-glance what to expect. Healthy Fast & Fresh Salads like the Chicken BLT Salad and Tex-Mex Beef-and-Beans Chopped Salad. Simple Suppers including Grilled Grouper with Watermelon Salsa and Black-Eyed Pea Cakes with Heirloom Tomatoes and Slaw. Speedy Skillets like Chicken Cutlets with Pecan Sauce, Easy Skillet Pimiento Mac-n-Cheese, and Fried Catfish with Pickled Peppers. As no Southern meal is complete without dessert, Hurry Up, Sugar offers up sweet ideas like Deep-Fried MoonPies and Key Lime Pie, prepared in a flash. Macaroni and cheese is a HUGE favorite around here and it is an easy meal to prepare. My hubby makes a mean home made mac and cheese and I was ready to give him some competition. In this cookbook, there is a recipe called Quick-Start Bacon-Cheddar Mac 'N' Cheese and it looked divine. So, I decided to make it for my family for dinner one night. You don't have to fire up the oven for this recipe...just use your microwave to melt the cheeses! I loved that idea too...it was a hot day when I made this so not having to use the oven was a plus. The first thing I loved about this recipe was that the ingredients were things that I already had in my kitchen. This makes opening a cookbook and picking a recipe super easy. The only ingredient that I left out was the green onions as my family doesn't eat onions. Here's the recipe! 2. Meanwhile, combine evaporated milk, cheeses, and black pepper in a large microwave-safe bowl. Microwave at MEDIUM (50% power) for 8 minutes or until cheeses melt, stirring every 3 minutes. This dish was a HUGE hit with the family. It is rich and cheesy and the bacon adds such a great texture and flavor. I am sure it is delicious with the onion in it too. Prep time wasn't bad either...I am not sure if it took less than 30 minutes or not as I didn't time it but honestly, it didn't seem to take that long. 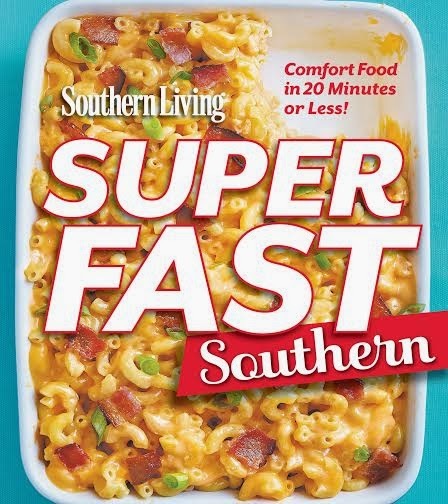 So, you can purchase this Superfast Southern: Comfort Food in 20 Minutes or Less Cookbook from Amazon and it retails for $15.90. Disclaimer: I received no monetary compensation for this post. I did receive a free cookbook for review purposes. All quotes and stock photos are from the Southern Living website and email. Prize is being provided and shipped by the sponsor. This blog is not responsible for lost, stolen or damaged prizes. All thoughts and opinions are 100% mine. My favorite comfort food is biscuits and gravy! A fast food burger or chicken sandwich. My favorite comfort food has to be fried chicken. My mom wasn't a great cook, but boy could she make a great fried chicken. My favorite is anything chocolate, dark if possible. I love macaroni and cheese with hot dogs cut up in it! My favorite is cheesy popcorn. Mac n Cheese is my comfort food.